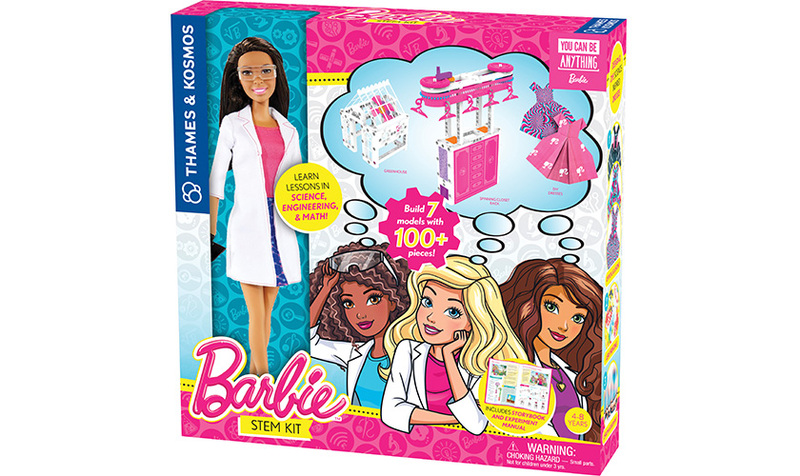 A couple weeks ago we received the Barbie Fundamental Chemistry Set from Thames & Kosmos to review. Being a homeschooling parent, I am always looking for fun educational kits and toys for the girls, that I can incorporate into our schooling. 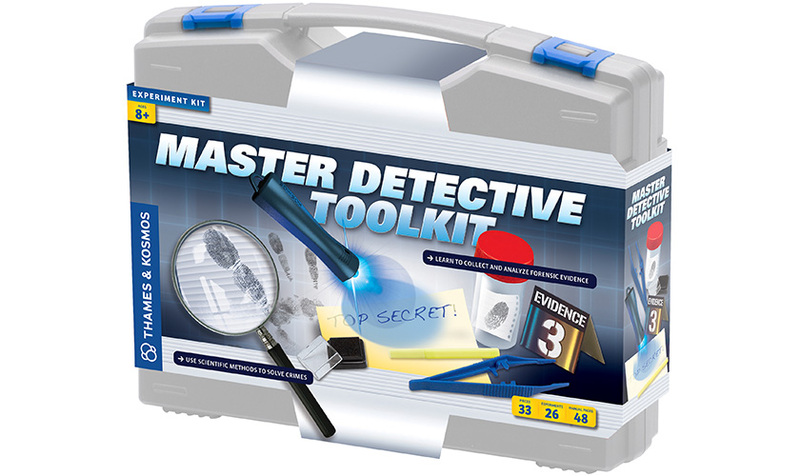 I have found some wonderful STEM-based kits from Thames & Kosmos over the years, and can only say great things about this company and product offering. So, when it came time to choosing items to include in my holiday gift guide, I knew I wanted to include something from Thames & Kosmos for other homeschooling families who follow my blog, as well as families who like to give educational gifts over your regular old toy that will find its way to the corner after a few times of play. 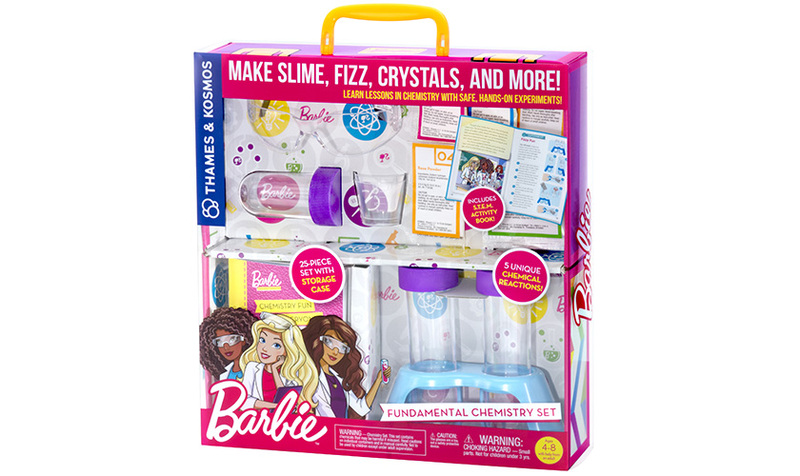 After looking at their site, I fell in love with the Barbie Fundamental Chemistry Set. What caught my eye about this sit was how much it came with. 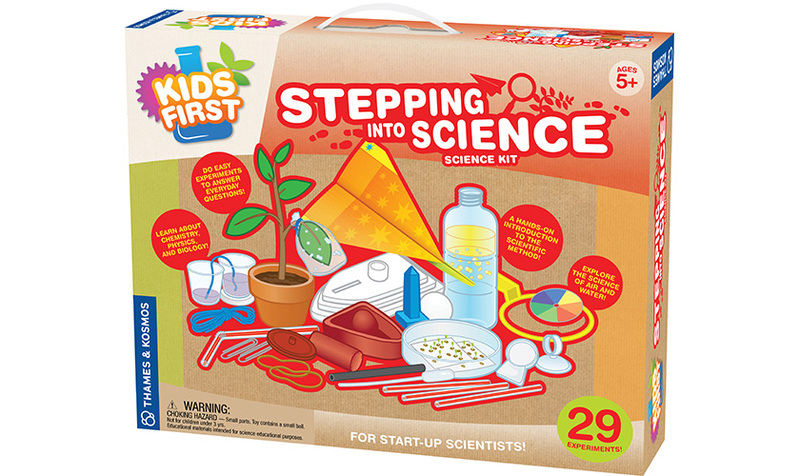 You get a 25-piece set storage case, as well a jam-packed STEM Activity Book explaining the 5 unique chemical reactions that you can do with all the supplies included in this kit. How does making polymer slime, fizzy reactions, crystal feather, color changing putty and oozing bubbles sound? Well, this is what you get when you pick up this chemistry set from Thames & Kosmos today. 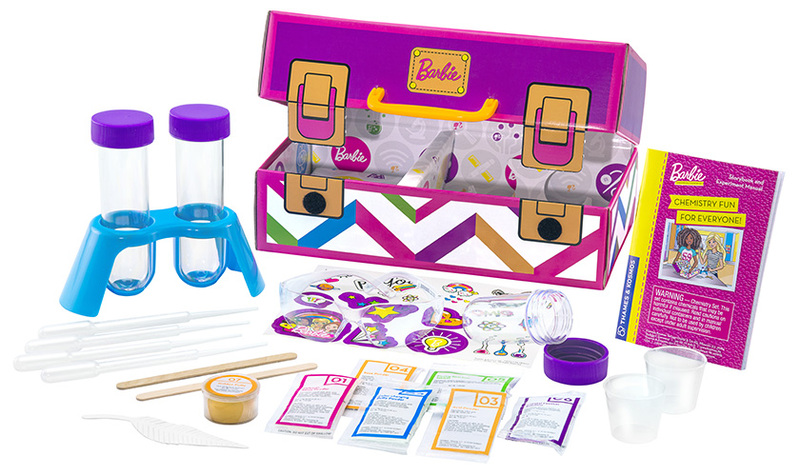 The kit is perfect for kids ages 4-8 years old, with the help of an adult. 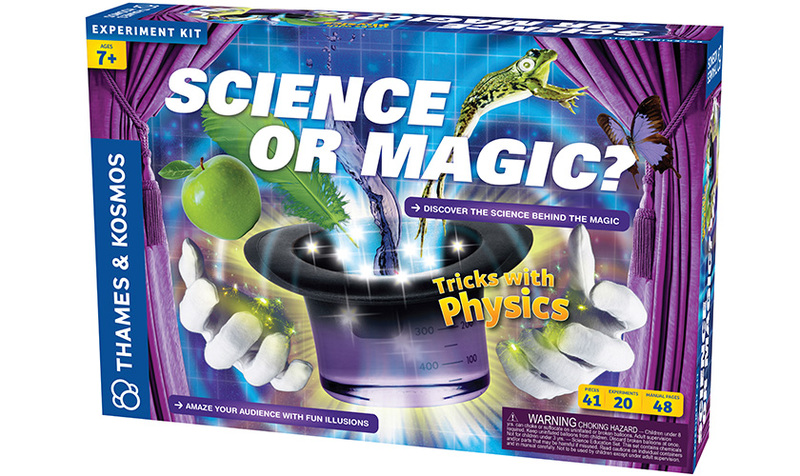 This kit really does come with a lot including safety glasses, measuring cups, test tubes and all the ingredients to make the chemical reaction experiments happen. I really liked how the STEM activity was laid out. You not only get the step by step instructions for each experiment, but the book also has a story featuring Barbie and her friends. And, as you read the story, you will learn the reason for the different chemical reaction experiments you will be doing. My girls love doing science experiments at home...the more fizz or explosion the better they always tell me. But, they never care to know why these reactions happen. I was happy when they really payed attention to me when I was reading the story and they said oh, this is why that happened and were talking to me about acids and bases and reactions, jut because they were able to relate the story to the different experiments. It was like a light bulb went on in their head, thanks to Barbie and her friends. Who knew science could be so fun and educational at the same time, said my youngest daughter. And, she was right. Each of the experiments we did with this chemistry kit were fun, and the girls still talk about chemical reactions to this day. They can't wait for me to get them more Barbie science kits from Thames & Kosmos, which I plan to do after seeing firsthand how much fun this kit was, and chock full of stuff it had. 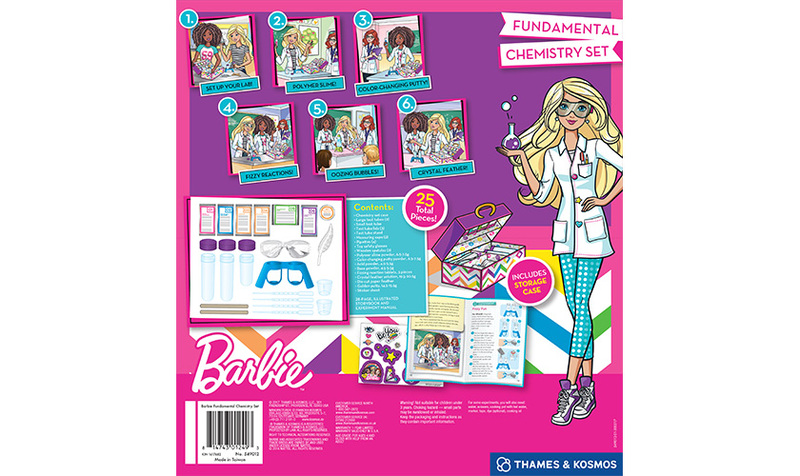 If you have a young child who loves Barbie or you want to expose them more to science in a fun way, why not consider picking up the Barbie Fundamental Chemistry set today from Thames & Kosmos. At only $29.99, you can't go wrong for the price. Even though we have done all the experiments, the girls have their leftover chemistry supplies -- glasses, test tubes, test tube stand, measuring cups, pipettes, wooden spatulas, etc. stored away in their fashionable storage case for when we want to do more science experiments. 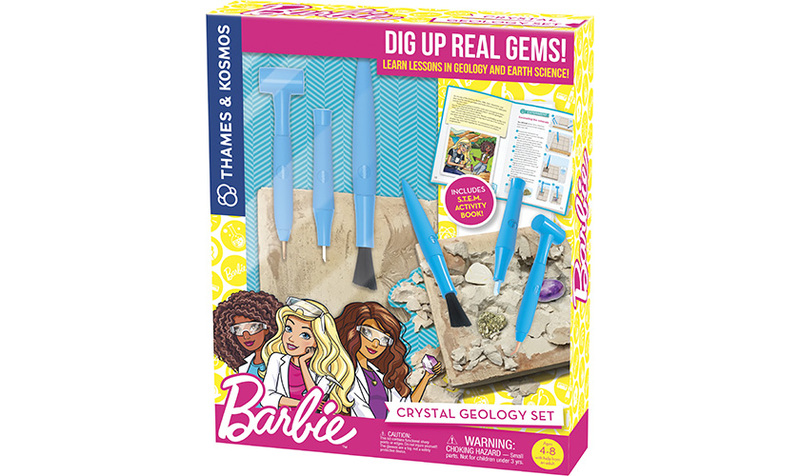 I love seeing the girls get excited about science, especially chemistry...and your kids will, too, when you pick up and share this amazing chemistry set with them today. 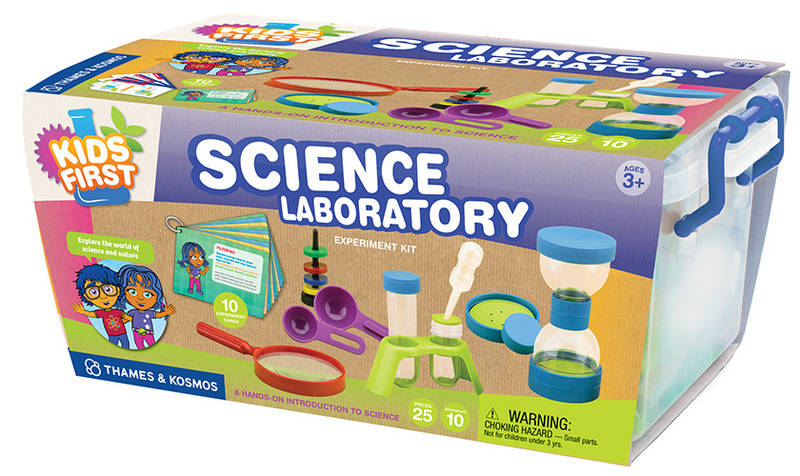 To learn more about and the other wonderful STEM kits and products available from Thames & Kosmos, visit their website today - http://thameskosmos.com.